I've been itching to check out Davanti Enoteca for quite some time now. It's a new Italian restaurant run by a restauranteur Scott Harris and Purple Pig alum, Executive Chef Jonathan Beatty. Purple Pig has been quite the hit with some of my friends so it's been on my list of places to go. We made it out there once, but the wait was too long, so we went elsewhere, which I, to this day, still regret. 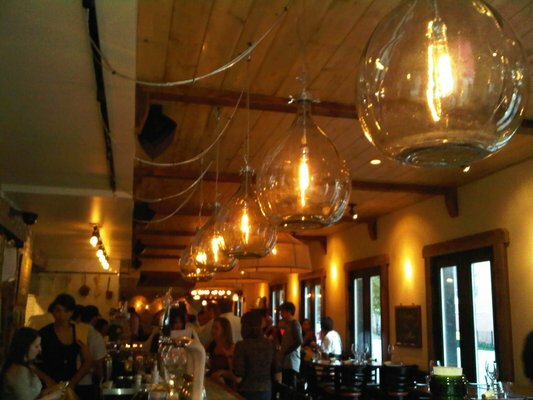 In any event, we finally made it to Little Italy one night to check out this new wine bar and restaurant that has been getting great reviews. They, similar to Purple Pig, don't take any reservations so it's first come, first serve. It was bustling when we arrived. There is a bar in the front so we had some wine at the bar while we waited. We soon discovered that you could order appetizers at the bar so we did just that. We started with a couple starters. 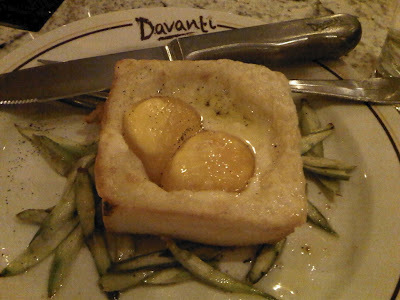 One of my favs was the Truffle Egg Toast, Fontina and Asparagus. Now if you have known me for any amount of time, you will know how much I love eggs. This is like the best appetizer I could ever dream up. Truffle oil and runny yolk, nestled in a pool of fontina cheese and crusty white bread, what more could a girl want? I don't recall ever having sauteed and slivered asparagus before but it added a nice touch and vibrancy to the dish. I will have to try cooking them this way next time. Asparagus stalks can be a bit unwieldy to eat sometimes and it's a nice change from the typical preparation that you see. 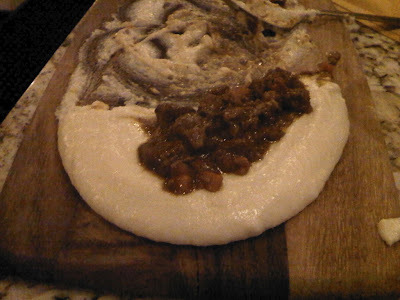 We also tried the Mascarpone Polenta and Ragu Of The Day. They bring out a wooden board and two bowls, one of which is filled with hot, marscopone polenta. 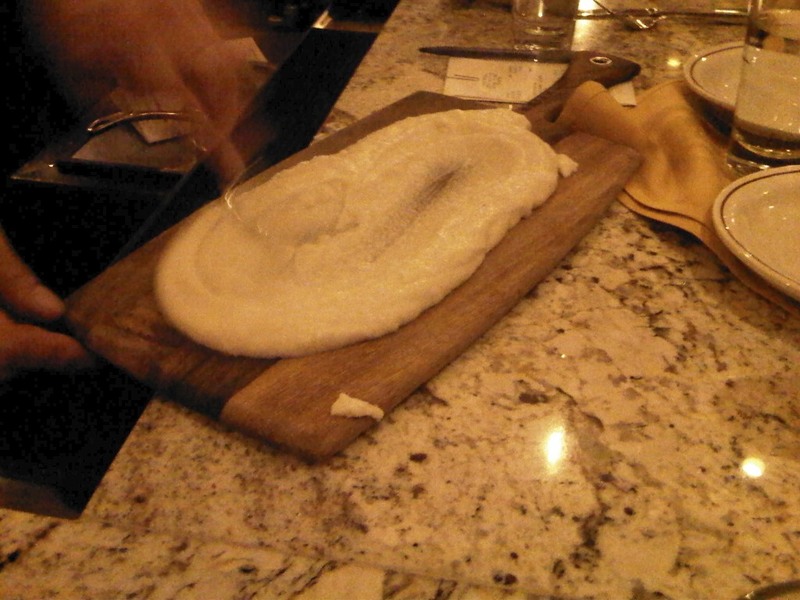 They pour out the polenta unto the board and liberally spread it around. 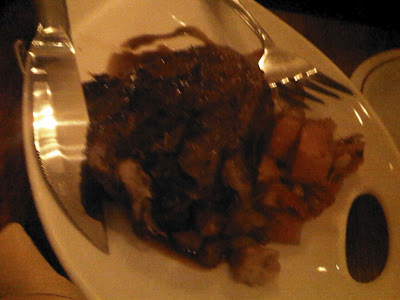 Next, they top it with the ragu of the day, which happened to be braised pork for us that night. This was sooo good. I'm surprised none of us licked the board clean. 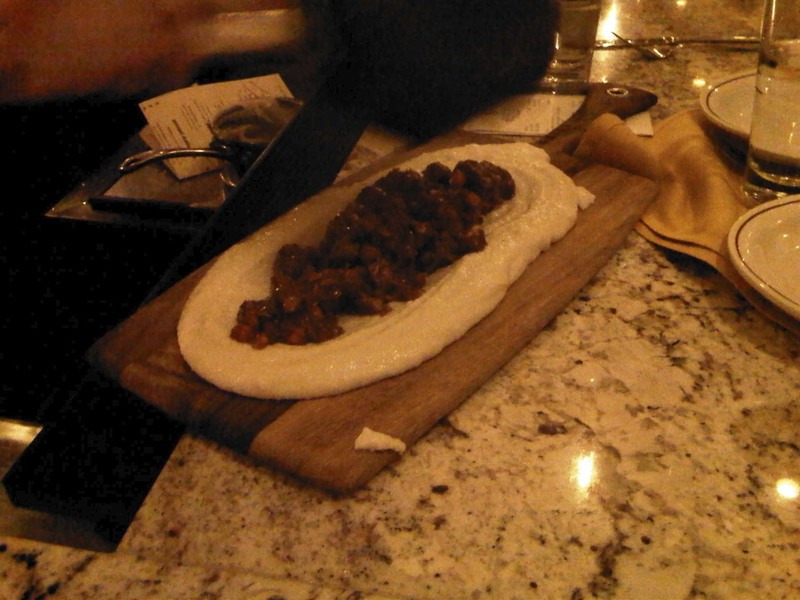 Here's another picture of the polenta and ragu, mid-damage. We also got some cheese and salumi to share as well. 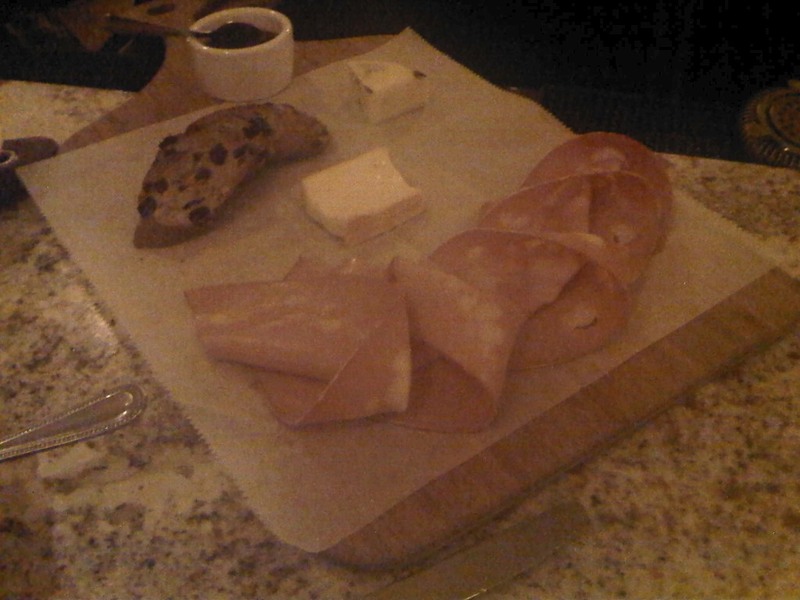 I think we got the burricotta (burrata style ricotta), rustica della val Taleggio (a creamy earthy & pleasantly salty cow's cheese), proscuitto di Parma and mortadella di Bologna (heat cured Italian salami). It came with some bread and some fig jam. Yum! 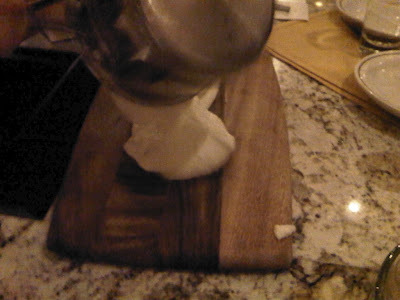 We also ordered some Cavoletti (brussel sprouts and pancetta), but I forgot to take a picture. Also, quite delicious. About the time we finished our appetizers, our table was ready. By then, our hunger was pretty satiated by the lovely appetizers and wine that we had, but we decided to split a few dishes anyway. 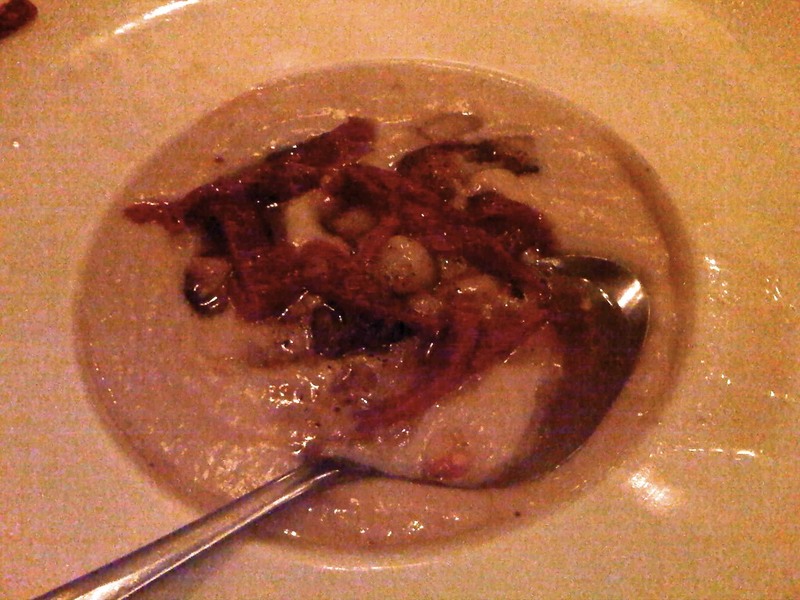 Roasted cauliflower soup with roasted red pepper happened to be one of their daily specials so we tried that. I can't remember what else was on this soup, but it was good. 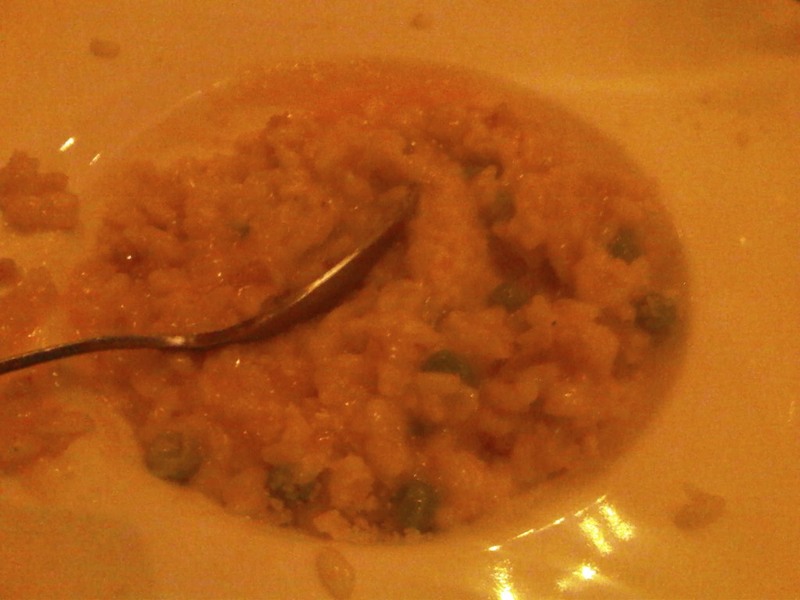 We also shared a Risotto Carbonara, which had pancetta, sweet peas, parmigiano and farm egg yolk in it. They also have an egg ravioli, which I need to try next time. I can't for the life of me remember what this meat dish was, maybe lamb? I just remember it being a bit salty. Maybe we didn't pick the best entrees, but the appetizers were real standouts. We're definitely going to have to go back and try some of their pizzas and pastas again. I also hear that they have a fantastic $10 burger and beer deal on Mondays. Who wants to take me? 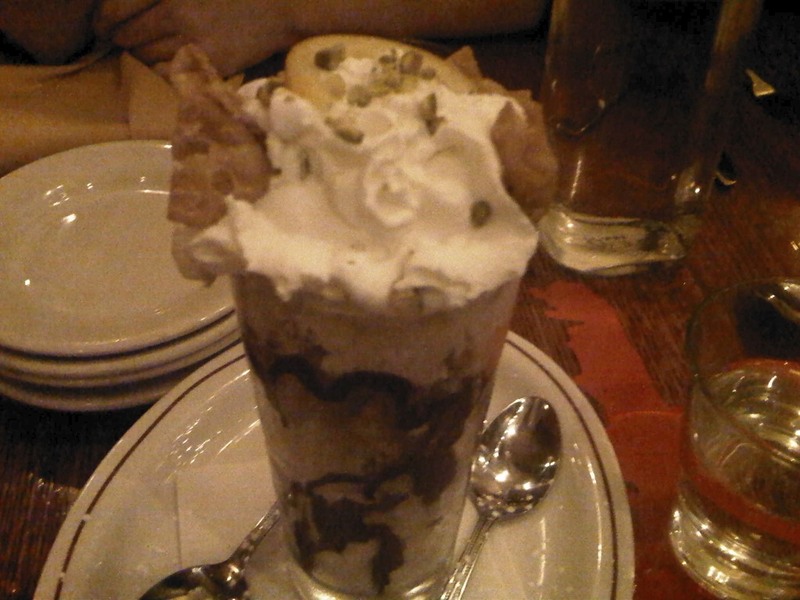 Now, we can't have a full meal without dessert, right? So we split a Cannoli Sundae which had sweet ricotta, crushed cannoli, pistachios, candied oranges, chocolate sauce and whipped cream in it. It was OK but not all that, in my humble opinion. Overall, it's really affordable for the quality and creativeness of the food and the place has a great vibe and energy to it. I'd definitely come back, especially for that truffle egg toast and that polenta and ragu dish. This place also sells wine at retail prices and you only have to pay a small corkage fee. It's also BYOB so you can bring your own bottle if you so desire. If you're in Little Italy, it's definitely worth a visit ... or two.